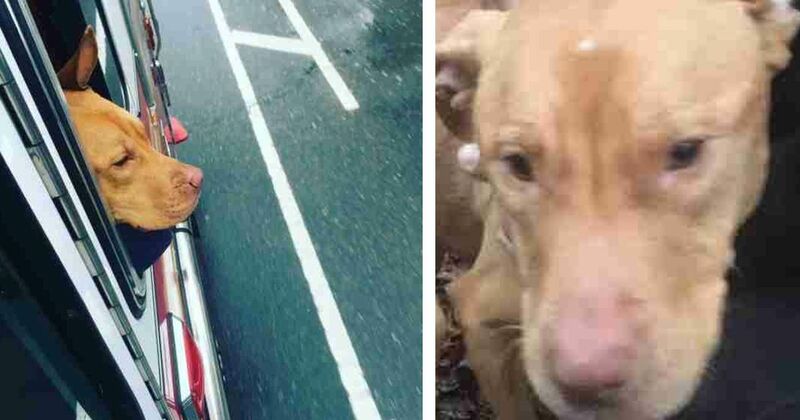 Sometimes, people can be unbelievably cruel to dogs. That's how Ashley's life began – with owners who didn't feed her enough, rarely let her outside and didn't seem to care about her at all. The couple and Ashley had been living in an abandoned house with no heat or electricity. When a snowstorm hit, the couple left – and left Ashley behind. Erica Mahnken, cofounder of No More Pain Rescue, received a call alerting her to Ashley's situation. And as soon as that call arrived, Mahnken and her fiancé, Michael Favor, went to retrieve the dog. In doing so, they changed her life. Favor went into the house, making Mahnken stay behind. The situation was dire, with the temperature in the house freezing. One-year-old Ashley had been left behind without food or water. Broken windows let in even more cold winter air, and the house was covered in feces. Ashley was thrilled to see Favor and jumped right into the car. Though Ashley seemed to be unharmed, she was very thin and all of her ribs were visible. A vet confirmed that Ashley was about 25 pounds underweight. In addition, the dog's head was covered in cigarette burns. 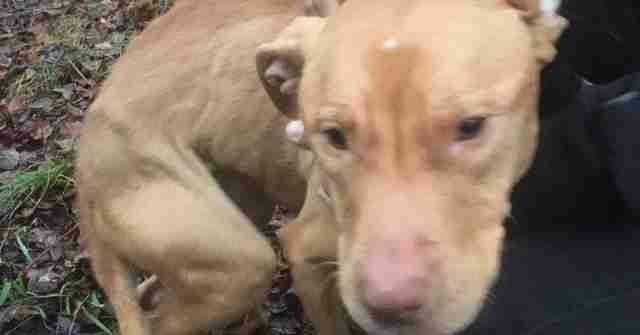 Because No More Pain Rescue doesn't have a shelter and depends on foster homes, Mahnken and Favor set about finding Ashley an immediate foster home. 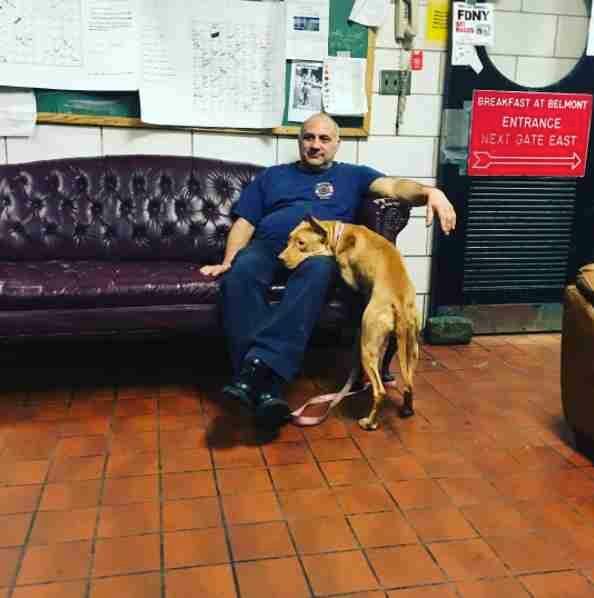 The couple had friends who worked in the New York City Fire Department, so they asked if the firefighters could foster Ashley until they could find another place. The firefighters agreed, and Ashley seemed to appreciate her new home. 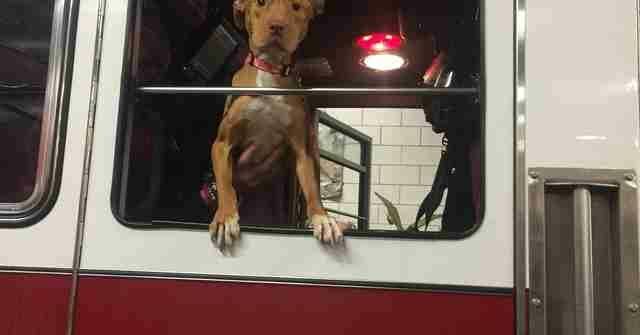 When Ashley walked into the firehouse, she wagged her tail enthusiastically. Then, she set about greeting everyone with licks. Despite her past and the way that humans had treated her, Ashley showed no fear or ill will toward anyone. 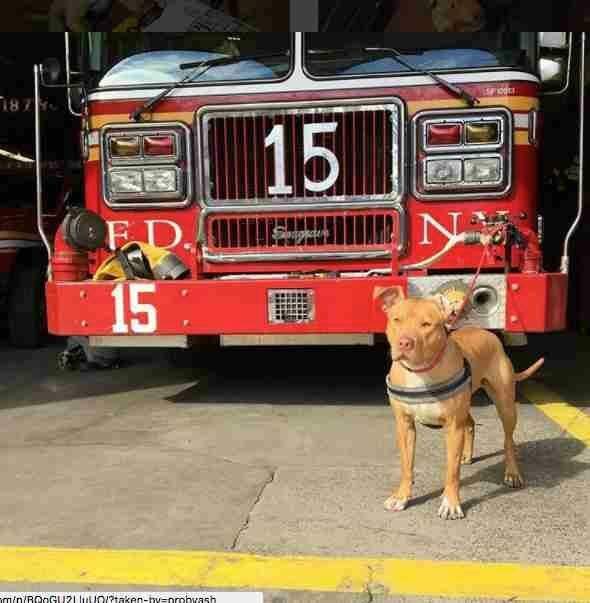 Ashley settled into her foster home so well, in fact, that the firefighters called Mahnken just a few days later. They had all gotten as attached to Ashley as she'd gotten to them. They asked Mahnken if they could make the arrangement permanent and give Ashley a forever home. 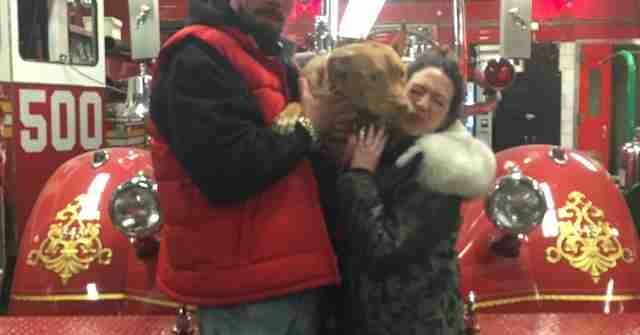 When Mahnken had walked Ashley into the firehouse, she'd known that was where the dog truly belonged. She was thrilled to hear that the firefighters felt the same way. They loved Ashley so much that they couldn't bear to let her go. 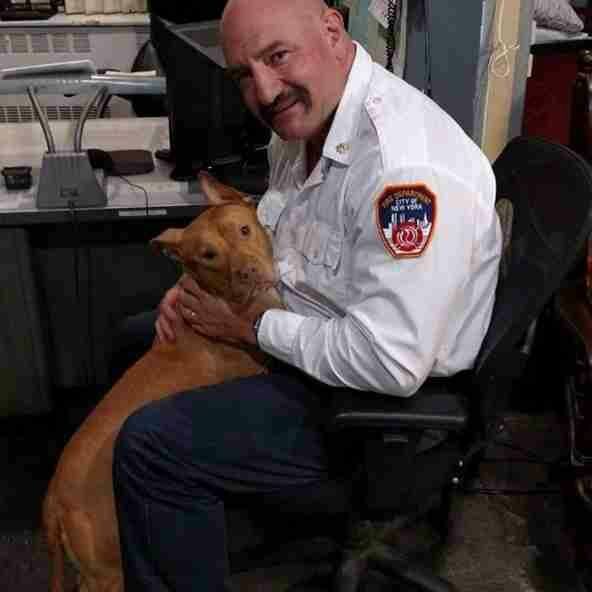 Now, the firehouse is Ashley's full-time home. And this high-energy dog finds plenty to do. The firefighters walk her about 30 times a day, and they bring her up on the roof for playtime. 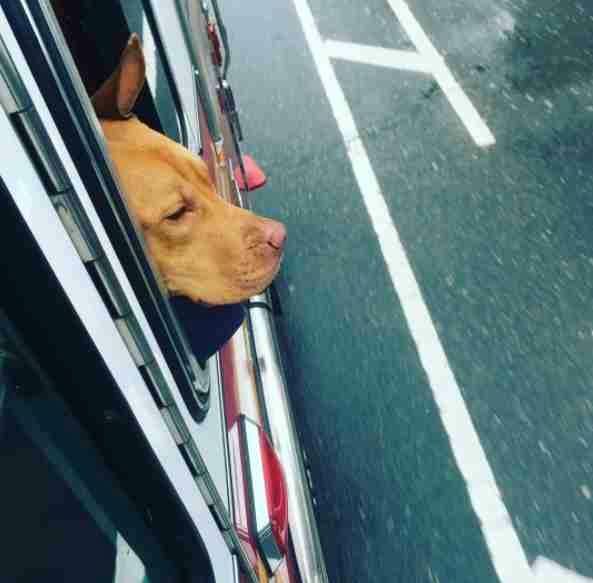 She even rides in the firetruck with them on smaller runs and has her own seat in the truck. Ashley's also discovered the firehouse kitchen and all the good food it contains. She spends a lot of time in the kitchen watching everyone eat. This lucky dog also has an endless supply of dog treats, of course. Mahnken is delighted that things turned out so well for Ashley. 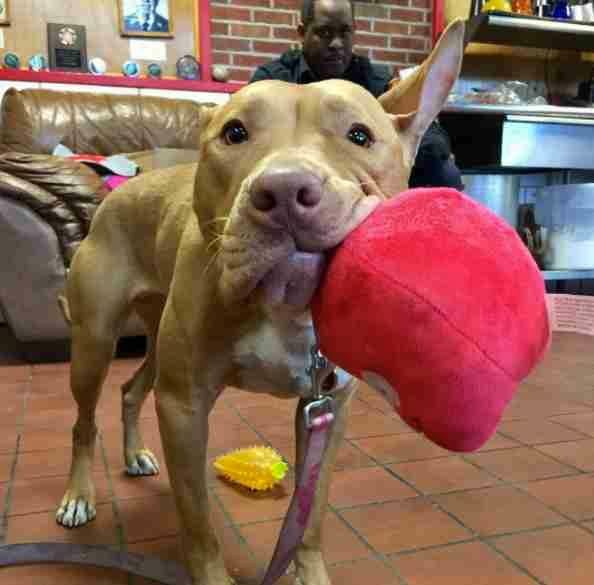 The firefighters show this lucky pit bull nothing but love; she's finally in a home where she belongs, and she will never be abandoned again. Ashley was lucky to have been discovered, rescued and placed into a home where she is absolutely adored. She's certain to have many adventures over the years.